Designed by Anna for students who identify women and girls, and who want to become more proficient at using power tools. 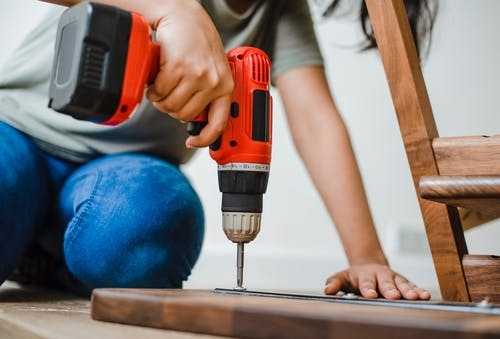 This class will increase your comfort in using basic power tools such as a cordless drill, random orbital sander, reciprocating saw and jigsaw. Participants are also encouraged to bring their own power tools that they want to learn to use properly and safely. The intent of the class is to gain familiarity and confidence with the tools, as opposed to building a project. You will experiment with different types of screws and hardware, learning what types of fasteners are suggested, depending upon the need. Like all of our classes, our supportive, non-competitive environment is the perfect place to ask questions, learn proper technique and gain comfort in using these tools – your next step will be to fix that pesky cupboard door or start a small building project! This class is Intergenerational, an adult may register and bring a student (12 years and above) at no additional cost, to work together as a team. Or any adult or student 12 years and above can register separately, to participate in the class.